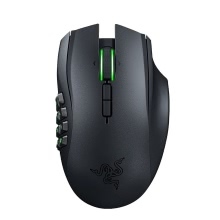 This is the best Wireless Mouse For MMO Gaming. The Razer Naga Epic Chroma features a total of 19 buttons, including the iconic Razer Naga&apos;s 12-button thumb grid to maximize the actions at your disposal. Now letting you map and access even more abilities, macros, as well as controls, the Razer Naga Epic Chroma makes it easy to hit the right button at the right time. With a response rate of 1ms whether wired or wireless, your Razer Naga Epic Chroma delivers peak performance all the time. Furthermore, by plugging in the USB when the battery is running low, your Razer Naga Epic Chroma charges while you use it, so you get zero downtime all the time. Key Features -19 MMO optimized programmable buttons for unlimited combos. -Up to 200 inches per second/50g acceleration. -Chroma lighting with 16.8 million customizable color options. -Dual gaming grade wireless technology. -Ergonomic right-handed design with textured rubber side grips. -Battery life: Approximately 20hrs (continuous gaming) The life expectancy of this battery depends upon its usage. System requirements -PC or Mac with a free USB port. -Windows10 / Windows8 / Windows7 / Mac OS X （v10.8-10.11). -100 MB of hard disk space. and internet connection needed to activate full features of product and for software updates.